I would buy one in a second but I can't part with $1500 at the moment. I actually need one. I got too many humidors and zip lock bags lying around. 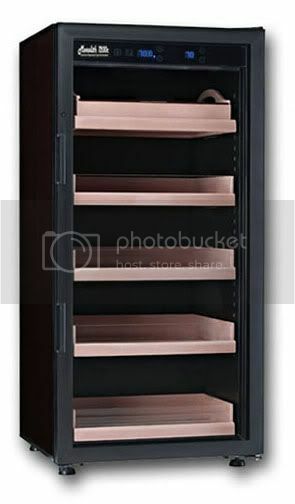 Wow, its out of my budget, but I would love to upgrade my wine cooler to a unit like that!! Hey alex, any chance we can get a picture of the one in your office, filled with cigars?? I am in chicago at the moment so I cant snap a pic. the one in PA in the office is already sold. Unfortunately, these have to ship as they are in one of our offsite warehouses. It works great. You definately need to put cigars in to help the unit maintain humidity some but the one in our office has been running for a few weeks nicely. Once you get it going it runs like a champ. A smaller version would be cool, the size of a 30 bottle wine cooler. Had I not just bought a new 45 gun fire rated gun safe this would have been the item for me. Doing a major renovation on the house. My excavator guy just told me today it will be an extra $1500.00. Damn it!!!! Alex, if its still here i June when I get my house back, let me know. Very nice. That's what I've been looking for. Any idea who makes it? What's it called, and what's the warranty? Awesome. It ain't in the cards for me, with school, but I hope some bork will be able to take you up on the deal. Out of my price range but that is awesome! I couldn't afford the cigars for it either but it looks like a great unit. That's right Alex, post this one week after I buy a cabinet for nearly the exact smae price which is about the same size. LOL. Oh well, I love mine. Maybe one day I'll have both. Very nice looking unit. Boy I sure would like one of these. Any anonymous benefactor out there want to make my wish come true? I'm on this one! Looks like my dreams have come true. Today has been a great day, just wish I would have seen this before Tim left the office for the day. Oh well guess I can wait until the morning to see if they have any left. she's a beauty, that's for sure... I'm just getting started in building up a collection slowly but I can see how one could get to a point of being able to fill that up one day, as much fun as I am having shopping for more sticks. For those of us in the cotm club, can we use our discount of top of that price? LOL I guess I never pondered that. Well COMC gets you 10% off anything except actual club membership cost and gift certificates, that is the way I advertise it and a deal is a deal. Ill honor 10% for COMC members. Alex, is there a warranty on these? I am seriously contemplating buying one. Also, do you know what the power requirements are? Oh... Kelly! ;-) Hottest cigar smoking chic! I can not comment on that, because I have never seen her & have only ever spoken to her over the phone or e-mail. What I can say is smoking hot is this deal that I just got from CCOM on this cabinet!!! Tim hooked me up and this should be here by next week. Excited oh so very excited! Guess Tim was very busy with end of the year reviews so it took him a bit to get back to me. I like a little suspense every now and then. Thanks to Alex for honoring COTMC 10% off and to Tim for the other stuff you looked up for me. Oh and the forum for allowing me to share my happiness. Just got off the phone with Tim. Got mine ordered too! Thats awesome guys. With all this cabinet buying going on soon we will need a "Cabinet Humi Picture" thread. I've wanted one for a long time. It would make life so much easier with all the singles I have in zip lock bags, tupperware and less humidor maintanance. I have 9 humis. However, I had originally wanted a regular wood cabinet to use as a piece of furniture. This makes it easier for me with maintanance. Thanks Alex. Now just need to clear out a space in the office for it.